Rio is one place we could see ourselves settling down at for a year or two. We found the Cariocas to be incredibly welcoming, the beaches amazing, a city with so many things to explore and the caipirinhas addicting! Here are some things to do with or without kids in Rio. If I did nothing else our entire trip to Rio de Janeiro but people watch all day long on Copacabana beach from my comfy lounge chair I would call my trip the most wonderful vacation ever! The beaches of Rio are filled with all different types of amazing people that you could sit and watch all day long. Thongs are the thing to wear and no one seems to have any body issues so don't over dress. Seriously, I never realized there were so many thongs until I started going back through our pictures and I now see how many photos my husband too of thongs, I mean people! You can tell the locals from the tourists by how much clothes they have on. Oh, and if you can peel yourself away from the beach long enough, enjoy the boardwalk of Avendida Atlantica that runs along the beach. It is a black and white, wave shaped mosaic that is a famous landscape of Rio. The song ran through my head the entire time I was there. 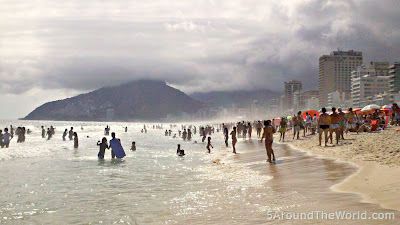 Ipanema beach is as crowded and as fascinating as Copacabana. Food and drink vendors galore. We enjoyed the biscoitos globo (powdered biscuits) and shrimp on a stick the most and of course the coconuts! Another place I could easily spent all my days at! Once a week and only on Sundays is a huge hawker market with lots of local handcrafts and souvenirs. One thing about Rio I found distressing was the lack of cheap souvenirs stands. Even the airport lacks souvenirs so don't wait until your heading home to buy souvenirs. Praca General Osorio Hippie Market has plenty so go there if you can and don't wait to buy gifts at the airport or you will be going home with nothing! Thank goodness there are an endless supply of hawkers walking the beach through the crowds. Remember, everything is negotiable. One tour I highly recommend is a tour of Rio's slums. It's such an enlightening and fun tour that you will regret not going on one. Read more about Let's go pay money to stare at poor people! Flying like a bird as you are surrounded by Rio's beautiful mountains and beaches is such an incredible feeling. The wind blowing through your hair and the rush of trotting of the hillside, of course, this is all happening with an instructor safely strapped close to. You have to be a bit flexible on the day you want to go as the wind is not always right for flying. A bit on the pricey side but well worth the splurge! Prices vary around $100USD This is one of those once in a lifetime adventures. Just remember, it's easier to go down then to go up so start at the top! A beautiful hilly district hosts an eclectic array of art and architecture. Stroll along the cobblestone streets and view the beautiful mansions and sidewalk mosaics. 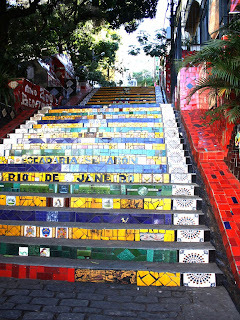 Catch a ride on the trolley to take you around the neighborhood and view the famous Escadaria Selaronsteps which were featured in the Snoop Dog video "Beautiful". Unfortunately, the trolley was not in service when we were there so we got plenty of exercise! Watching the stealth moves of some stunning Brazilian dancers wishing you could move like them while enjoying the music andcaipirinhas sounds like a fabulous afternoon to me. Brazilians do have some incredible dancing skills. In preparation for Carnival several of the Samba schools organize rehearsals for the public all year long. It's like a mini Carnival. To save money avoid the package deals your hotel offers and grab a taxi and head to the local favorite Mangueira school. The closer to Carnival the most refined and colorful the acts become. Check with the school for date and times before you head out. You will be so glad you went. You will never know the true passion of a Cariocas until you've sat next to them at a soccer game. Soccer is a worldwide religion so why not go watch a game at the largest church? Estadio Do Maracan is the largest stadium in the world. Nose bleed will run you about 15USD and get you next to some of the wildest sports fans ever! Rio is home to the 2016 Olympics so it will be extra crowded but still a super fun time! Have you been to Rio? What did you love the most? We'd love to hear you comments below!